In collaboration with Yoga Teacher Sonja Tessari from Top of Mind Yoga. Before we get started, let’s get to know Sonja a little better. Sonja is a veteran yoga teacher at SunYoga in Oakville (Ontario) guiding her students through yogic sequences a few times a week. She was previously a power walker for a number of years and even completed a half-marathon during that time. Combining both her knowledge of endurance sport and yoga, Sonja has developed a great understanding of the human body and loves to encourage her students to move with their breath. More recently, she collaborates with WalkingFit and ourselves, C’est la Vie Wellness, to create Challenge 150 – a year long event celebrating Canada with monthly challenges focusing on a holistic approach of mind, body and spirit. 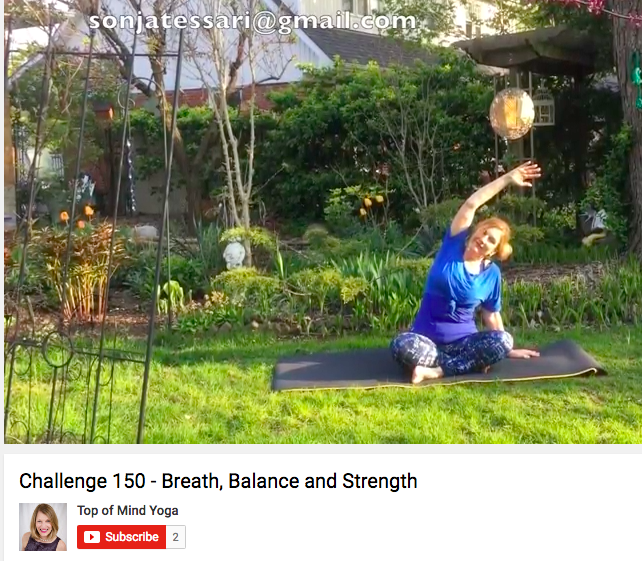 This month’s challenge is daily 10-15mins yoga and Sonja was able to create 4 different yoga sequences available to all… for FREE! Now that said, here I am asking my top 6 questions to one of my favourite yoga teachers, Sonja Tessari. If ever you have any questions regarding your yoga practice, feel free to contact her at: sonjatessari@gmail.com. Enjoy and namaste! 1- Why do you think yoga is so important? We are all beings of energy. Yoga is one way to move our energy to ensure stress does not “get stuck” in our cellular system. Research shows increase in illness is due to a breakdown in our immune system and the factors causing this breakdown is imbalance with our sleep, diet and exercise. The Yoga practice is movement which helps to release stress, using breath and focus, thereby creating an openness in our body and our mind. 2- What is the most common benefit you hear your students mention after a yoga class? Most often I hear people say they feel better. They describe their “feeling better” by saying; I sleep better, I feel calm, my body is less tight, I feel uplifted, I feel like I can cope, I feel clear in my head, I have less headaches, more energy, I feel taller, I am walking straighter, I feel less aches and pains, my back isn’t hurting, I like people again, I like myself, I want to get up in the morning, things don’t bother me as much, I feel happier. 3- What is the biggest obstacle or hurdle to overcome as a yogi-beginner? The biggest obstacle for anyone, beginner or a well seasoned yogi is to get on your mat. There are so many things in our lives that take us out of doing yoga. One of the biggest hurdle is allowing ourself the time for our yoga practice. Once we feel the benefits of yoga we begin to carve out the time. Whatever you tell yourself the reason is that you go to yoga – there are 20+ more benefits your body is receiving that you aren’t even aware of. Your body registers the benefits within 3 to 5 classes but the anxious mind or social pressure will tell us that we need to do other things. 4- How does yoga affect your mental wellbeing? Yoga helps us to separate the mind from the body. While in our practice we experience glimpses of strength, and balance, we feel humility and vulnerability, and we rinse out stress to access clarity, calm and perceptive. We learn to become comfortable with being uncomfortable and this builds tolerance, forgiveness and acceptance in our nervous system which externally makes us less reactive and more responsive to our surroundings. 5- Where do you see yoga going in the next 5-10 years? West meets East! What I mean by this is in the East most people have their own personal yoga practice. I can only hope that more people will come to their own personal practice because they have connected to the benefits of yoga. Ideally all children should be doing yoga, as it will benefit their nervous system and prepare them for the many challenges they will be facing as they mature into adults. 6- Why do you think everyone is doing yoga? In the practice of yoga, students access a variety of physical, mental and emotional traits. These are all human traits and as humans we want to feel our human-ness. We all want to know what it feels like to be a human and while on our mat we can access emotions in our body that we can’t in our day-to-day lives. There are so many forms of yoga which makes it accessible to everyone too! A big thank you to Sonja Tessari! As always, feel free to let us know why you do yoga… we love to hear from you! Loved this post Why is Everyone Doing Yoga? . Sharing it on my Facebook and Pinterest profile.